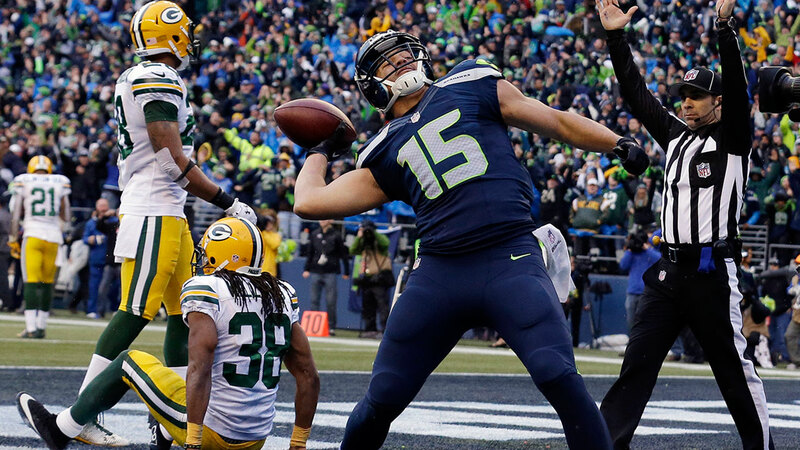 SEATTLE, WA -- Russell Wilson hit Jermaine Kearse for a 35-yard touchdown 3:19 into overtime to lift the Seattle Seahawks to an improbable 28-22 victory over Green Bay in the NFC championship game. Outplayed much of Sunday and plagued by five turnovers, the Seahawks (14-4) trailed 16-7 with 2:09 remaining. That's when Wilson ran 1 yard for a TD. Seattle recovered a bobbled onside kick at the 50, and Marshawn Lynch sped and powered his way to a 24-yard TD run. Wilson's desperate 2-point conversion pass was hauled in by Luke Willson to make it 22-19. But Aaron Rodgers led the Packers (13-5) to Mason Crosby's fifth field goal, from 48 yards with 14 seconds to go.